Poetry, Fiction, Nonfiction, Cross-genre, Book Art, Philosophy, Dreams, Place, Photography, Illustration, Art, Radical, Film, Theatre, Experimental, Women, Bay Area, Autobiography, Fairytale, LGBTQ, Essays, Stories, New Narrative, Writing How-To, Compilation, Collaboration, Translation, Poetics, Performance, Body, Criticism, Politics, Film, Contemporary, Music, New York, World, Classic, Eclectic, Comics. We especially recommend noting one of the three genre categories (poetry, fiction, or nonfiction). 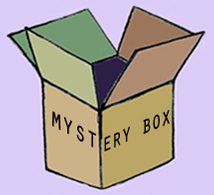 We'll do our best to tailor your box, but again there are no guarantees with the Mystery Box except that it will blow your mind.